Palm Court, Located in Katherine 500m from CBD, on the road leading directly to the famous Nitmiluk (Katherine Gorge). Katherine is the crossroads to Kakadu and Litchfield National Parks, Uluru and the Kimberley regions. Our friendly and helpful staff are here to provide you with valuable advice to help you plan your travel itinerary in the Northern Territory. Palm Court Kookaburra Backpackers is a friendly place to stay, providing the perfect location to meet with your fellow travellers. Located only 5 minutes walk from the CBD. 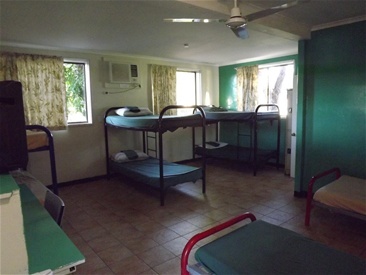 Palm Court Kookaburra offers air conditioned dorms, standard doubles, self contained doubles and twin rooms. All rooms have ensuite bathrooms and TVs. Booking agent for Springvale crocodile night tours and Nitmiluk. Our policy requires the customer to cancel their booking at least 24 hours prior to 4pm check-in time on their booked arrival date. We reserve the right to charge the equivalent to one nights accommodation if booking is not cancelled within this time frame. Palm Court offers 4 bed share dorm rooms. All dorm rooms have there own ensuited bathroom, including shower, toilet and hand basin. fan and air conditioner.